paul gregutt's washington wine blog – unfined & unfiltered: can washington merlots improve with age? absolutely! can washington merlots improve with age? absolutely! Wine writers (I plead as guilty as any) love to make predictions about how well and how long young wines will age. It’s a time-honored part of writing tasting notes, and it’s intended to be helpful, although I am never entirely sure that it is. For one thing, it encourages the bad habit of squirreling away young wines until they reach some magical “best age for drinking.” There is no such age, for any wine, any more than there is a single year when a child is best and should be enjoyed. For another, predictions about aging are a guess, pure and simple. Every writer has his or her own methodology and predilections for making them, but who ever goes back to see how they turned out? Well, in fact, I do. Whenever an opportunity to taste older wines appears, I am delighted to see how they are doing. Given that my memory is as leaky as an old tub, there’s little chance I will be prejudiced by recalling what I said about the wine when it was first reviewed. So I make my notes and then go back to look up what my previous review had to say. Recently, while tasting through a selection of excellent new releases from Marie-Eve Gilla, Forgeron’s founder and winemaker, I had the opportunity to revisit a 2003 Forgeron Merlot. This is a wine that I had spoken of fondly to the winemaker some years ago. How, I wondered, had it aged? In February of 2006, it was poured at a special event honoring the late Devin Derby. At that time it had just been bottled and was not yet released, and yet on that occasion it was clear that it was a marvelous wine, rich and muscular, dense and deep, and I immediately was drawn to it. My (unpublished) notes from that dinner read “this Forgeron 2003 Merlot is dense and beautifully concentrated. This smoky, inky, tarry Merlot is loaded with cassis and black cherry fruit. Flavors linger beautifully, suggesting a good 6 – 8 years of life ahead. I next tasted it in December of 2007, when it had been officially released. I gave it a 90 point score (in retrospect too low), writing “this nicely aged, 100% Merlot opens with round plum, cassis and black cherry fruit. It’s a blend of Klipsun, Boushey, Clifton and Alder Ridge grapes, from four different AVAs. Its long, thick tannins extend the palate impression and the nicely melded fruit and barrel flavors linger beautifully.” I stuck with my earlier prediction that it had a good 6 – 8 years of life ahead. So here it is, six years later, and I opened the wine again. Softer, smoother, a bit lighter, it remained a riveting bottle of Merlot, with maturing, but far from over-the-hill secondary fruit flavors, silky tannins, and perfect balance. I drank a glass and put the cork back in the bottle. I returned to it the next day, only to find it was every bit as good, with no sign of decay. If anything can possibly prove longevity, I think that is it. Take a wine of a certain age, open it, and taste it over a two-day period. Not many can pass that test as this one did. 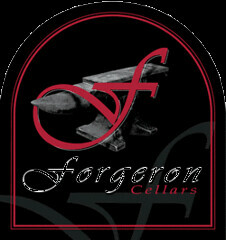 The newest Forgeron Merlot, from the 2010 vintage, has every bit as much potential. An A+ trio of vineyards – Olsen, Stonetree and Boushey – contribute equally to the blend. Tight, tart and perfectly proportioned, this young wine at first offers scents and accents of sweet tomato paste and a whiff of oregano, then opens further with lush cherry flavors and a dash of dried tobacco. I look forward to tasting it again in 6 – 8 years. My experience with properly cellared Merlot from Washington is quite limited, but some of Eric Rindal's early releases at Waterbrook were fascinating. Eric said they were partially influenced by viticulture practices at the time, and he admits they could be a difficult sell. The kind folks at Precept allowed me to sit at the table with Eric and John Freeman for a library tasting earlier this year, and Eric's comments on each wine were insightful. If you are willing to share, here's the link to the report from that day. Thank you Eric. Interestingly, the 1984 (first vintage) and 1987 Waterbrook Merlots were poured at the recent Celebrate Walla Walla event. Both well along in age, but still interesting. I remember a blind tasting of 1989 vintage Washington Merlots I did many years ago when they were young wines and it was the Waterbrook that stole the show. I think it sold for around $7 or $8. That was the first time it became really clear that Merlot in Washington, even at the low price end, was something special. Merci beaucoup Paul, I've just returned from a working vacation in France and only saw this now, it is a wonderful piece! It has been quite a privilege for me to witness the growth and maturation of WA State Wine Industry over the last twenty years. The increasing availability of older wines from WA tells a great tale about vintage variation and vineyards realizing their potential. I've been enjoying many aged Merlot's each year and have been delighted by the development vintage after vintage. I'm really excited by the potential for Washington State in this category. Of course, I also love working with Cabernet Sauvignon, Syrah and Zinfandel for the promise of longevity they're showing.